A garden “à la française” with designs inspired by the Flemish Renaissance was created for the pleasure of the eyes and spirit. Its stiff structure, three large rectangles with their decorative stylised designs, was inspired by the vegetable kingdom, heraldry and geometry. 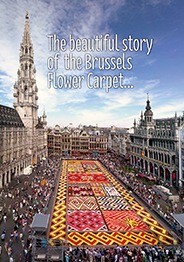 In 1996, the Flower Carpet, was conceived as a garden “à la française” with designs inspired by the Flemish Renaissance. A fancy garden merely created for the pleasure of the eyes and spirit. The structure of this garden is quite stiff with its three large rectangles and their decorative stylised designs, inspired by the vegetable kingdom, heraldry and geometry and surrounded by a wide border. To celebrate the 10 th anniversary of the event, Lords and Ladies escaped from the famous Ommegang and threw flowers in the crowd on the evening of the opening. Children had their own little carpet on the lawns of the “Parc de Bruxelles”. Dingo and his son Max were the guest stars.